Sony hasn’t exactly been highly secretive about its upcoming tablet duo — currently codenamed the S1 and the S2. The devices have already enjoyed fame in a series of teaser videos that began last month, and Sony even allowed the press to play with the devices following the company’s announcement with AT&T a couple of weeks ago. However, there’s a few things that Sony has so far neglected to mention, and the one we’re most interested in is specifications. 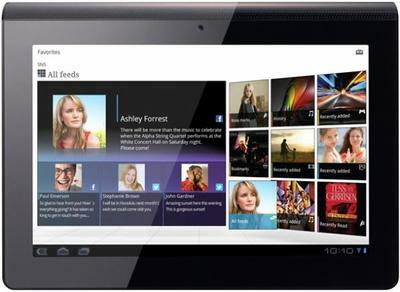 We already know how pretty these tablets are on the outside, but will their internals make them a worthwhile purchase? Thanks to a source for CNET, who is “familiar with the company’s plans for the S1 and S2,” the wait for some specifications is now over. Of course, until this information comes officially from Sony, it’s best to take it with a pinch of salt. The S1 is said to sport a 9.4-inch IPS display, just 0.3 inches smaller than Apple’s iPad, with TruBlack and Bravia display technologies. The device will also feature a full-sized SD card slot, with battery life “comparable to the iPad 2.” That’s around 10 hours while surfing the web on Wi-Fi, watching movies, or listening to music; and around 9 hours while surfing the web using a 3G data connection. The S2 is the smaller of the two tablets, featuring two 5.5-inch displays that fold together when closed. Both devices are said to be PlayStation certified and will run Android 3.0 Honeycomb, with a custom interface that features some of Sony’s existing services like Qriocity. Unfortunately, CNET‘s source did not provide details on the processors and RAM packed into each device, so we’re still left to wonder just exactly what these devices may be capable of. Based on those specifications, do either of Sony’s upcoming devices interest you? I certainly like the sound of the S1 — especially with that PlayStation certification — but it’s too early to say whether the device will do enough to tempt me away from the iPad.